A New Hampshire State Police officer pulled a driver over for tailgating another vehicle -- only to make a surprising discovery. Michael Donovan, 26, of Westminster, Massachusetts, was driving a Nissan Versa on I-95 in North Hampton on March 31. As the officer engaged in a conversation with Donovan, he detected a strong smell of marijuana coming from the car. He called for a trained K-9 unit to come to the scene to assist with the investigation. The officer had the Nissan towed to the State Police barracks in Epping, so that he could apply for a search warrant. Donovan was released at the scene and given a ride off the highway. 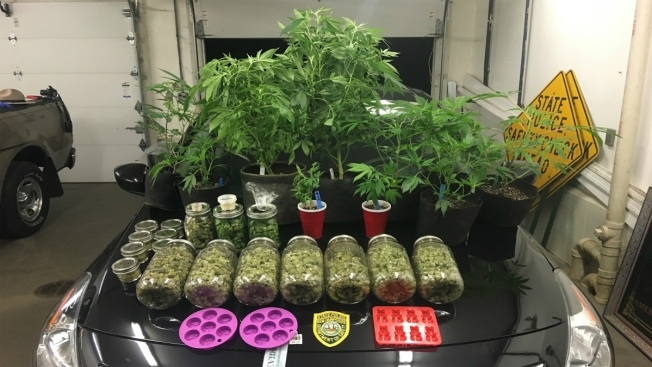 After obtaining a search warrant for the vehicle, police discovered the following items: 17 glass jars containing approximately two pounds of marijuana, and 10 marijuana plants. The estimated street value of the marijuana is approximately $35,000. An arrest warrant is forthcoming for Donovan, charging him with possession of a controlled drug, transportation of a controlled drug, and possession of a controlled drug with the intent to distribute.